Emprisonne mon cœur, et je ne puis r’avoir. Y reconduit mes pieds abusé d’un espoir. « Le ciel faisant tourner ses desseins au rebours. Mais quoy, puis que le Ciel delibere au contraire ? Lead my feet back there, misled by hope. So what, since heaven has made different plans ? Apart from telling us that he has been in love with Marie for 15 months, this poem adds little to our knowledge of the affair: and if we note (with Belleau) that it is based on a Greek original (an incomplete poem by Callimachus) that need not mean that even that detail is invented. We’ve met Pardaillan before, in the previous poem of the set. D’Amour, tousjours m’y mène, abusé d’un espoir. Mais le Ciel fait tourner ses desseins au rebours. Of Love, always leads me back there, misled by hope. But heaven turns his plans upside down. Le sçait, le voit, et si ne le veut croire. Voit bien ma playe, et si la prend à gloire ? Moins me veut croire, et m’appelle un moqueur. Knows it, sees it, yet won’t believe it. Whatever unhappy disaster, yet glory in it? The less she believes me, and calls me a mocker. Me fait la playe, et si la prend à gloire ? Gave me this wound, yet glories in it? In line 5 Ronsard has as usual swapped out an exclamation, and found a neat way or replacing it. I rather like the earlier version of the rest of the stanza! And he tidies up the grammar in lines 9-12, another late-Ronsard feature. His commentators tell us this derives from a Petrarchan original; but as so often it takes ideas from the original without really ‘translating’ it. In fact Ronsard’s poem corresponds to the first half of Petrarch’s: apologies for the slightly loose translation, I’m not sure I have really understood all of Petrarch’s Italian! ella non par che ‘l creda, et sí sel vede. non vedete voi ‘l cor nelli occhi mei? al fonte di pietà trovar mercede. rimaner, dopo noi, pien’ di faville. Who is above all others, and whom alone I wish to. Don’t you see my heart in my eyes? At the fountain of pity to find my reward [mercy?]. Remaining after us, full of sparks. Le sein le ventre et les flancs de m’amie. Qui fait semblant de la venir penser. Qu’il eust mon mal, et qu’elle fust guarie ! Breast, chest, stomach and sides. Look at her breasts, eager to make love to them. Who pretends to come and put a dressing on her. With my illness, while she is cured! It seems that Marie did not just have an eye condition: here a doctor is visiting to check on a chest complaint. This time, though, the malady may be fictional, because the poem is based on one by Ovid – one of the Heroides, a series of invented letters between famous mythological characters. The later change (above) removes the clumsy “voir … voir” (which I’ve hidden by using two different words in the translation!). Then in line 10 the early version has “Je vous supply de me chasser bien loin” (‘ I beg you to chase this doctor far away for [or ‘from’] me’). Blanchemain helpfully re-spells the word “panser/penser” in line 12: no change in meaning, simply one of orthography. Clearly there was no (or very little) difference in pronunciation, though the meaning is conveyed more clearly when the word is not spelled the same as “penser”=’to think’! Qui si fiers contre moy me font si doux effort. Seulement au trespas seroit son reconfort. Ceux qui de ses regars osent bien approcher. De quel monstre, Lecteur, at-elle pris sa race ? Which, so bold against me, make on me so sweet an effect. Only in death would there be comfort for him. Those who dare to come near her glance. From which monster, o Reader, is she descended? From one Greek image to another, much more familiar one. Our commentators tell us that each of the verbs in line 12 is a Ronsardian innovation – though perhaps only the third (‘turn into fire’) is unusual. In the last line of the Marty-Laveux version above, “a-t-elle” (as we would spell it today) is apparently also an innovation by Ronsard, to avoid the hiatus in “a-elle”: it’s so much a part of the language now, it’s hard to realise someone invented it – and yet here is it’s first appearance. Blanchemain’s version is rather different in detail throughout: you can see why he would (for instance) have re-worked “du sien n’est rien” in line 10; the reference to hell in line 6 is (perhaps) a rare moment of the later Ronsard being more vivid than the younger; and the later last line is much more effective! Qui, si fiers contre moy, me font si doux effort. Et si en les tuant la mignonne se joue. And yet, as she kills them, the darling enjoys herself. Pour crainte d’un seigneur, la cause de mes maux. O lierre amoureux, de tous les arbrisseaux. Escrivant dessus toy s’amour et sa pensée. For fear of a lord, the cause of my ills. O lovers’ ivy, over all trees. Writing on you her love and her thoughts. Never seeming to be at a loss for a mythological parallel, Ronsard may sometimes have resorted to inventing what was not explicitly handed down from antiquity… Is there any version of the story of Ariadne being abandoned by Theseus on Naxos, in which she wrote her complaints on ivy? I’m not aware of one! 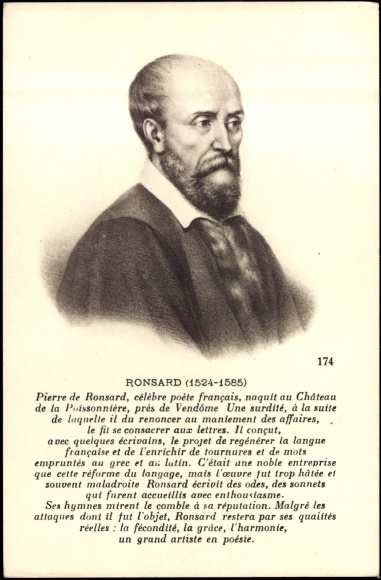 Still, it helps Ronsard to have a classical precedent for what his Marie apparently did, and so he produces one. However, Ariadne’s story does include her rescue by Dionysus (the son of Zeus and Semele) though normally he discovers her there by chance. Here, Naxos is ‘Dia’ (a name applied to many small Greek islands – you can see one to the north of Crete from Heraklion/Iraklion and the beaches east of it – and generally assumed to mean either ‘a goddess’s [island]’ or perhaps to refer to Zeus). This was one of the (slighter?) poems Ronsard did not rework much: Blanchemain’s earlier version varies only in two places: in line 1 where his heart, rather than his soul, is attached (“J’auray toujours au cœur attachez les rameaux“); and in the penultimate line where Ariadne ‘writes’, rather than ‘relates’, her troubles (“luy trassa ses ennuis”).